With the NCAA Tournament just over 24 hours away, we continue our breakdown of the entire field. After looking at the South and West regions in the last two days, it’s time to examine the East region, where top-ranked Syracuse was not given an easy road to New Orleans. Come on…how could we not pick this game? This should present a classic 5-12 matchup between a Vanderbilt team fresh off a victory over Kentucky in the SEC Tournament and Tommy Amaker’s squad from Harvard. Vanderbilt’s had the epitome of an up and down season this year. After being ranked in the preseason top-10 and falling completely off the radar, they turned it on again late in the season and are now being considered one of the contenders in the East regional. Their run to an SEC Tournament championship boosted their seeding up to a #5, despite having not been ranked higher than 25th in the AP poll since November. While some believe that Vanderbilt may be overseeded, just as many believe Harvard was victimized by the selection committee. Despite being nationally ranked for five weeks throughout the season, the Crimson could only muster a 12-seed while many believed they were deserving of a 10 or 11. All in all, this should be a great basketball game. Vanderbilt has proved throughout the season that they are capable of beating any team in the country, but they are also capable of losing to any team in the country. Harvard has played consistently throughout the season and are an extremely well coached team, but other than matchups against Florida State and Connecticut early in the season they haven’t faced an opponent this good in a long time. Expect for this game to be close into the game’s final five minutes, but ultimately Vanderbilt’s athleticism will prove too much for Harvard. Jenkins, a 6-foot-4 guard from Hendersonville, Tennessee, is the key to the Commodores’ offense. They have a great opportunity to advanced deep into the East region, but if they are going to do so Jenkins will need to be on his game. He averaged 19.9 points per game for Vanderbilt on the season, shooting a 44.8% clip from 3-point range. Not only has he proven that he’s able to knock down crucial shots from deep, he will be especially important for the Commodores late in games, shooting 84.3% from the free throw line on the year. With a tough first round matchup against a defensively-minded Harvard team and a potential second round tilt with Wisconsin, Jenkins is a huge piece to how this region will play out. It was announced yesterday that Syracuse’s pursuit of a trip to New Orleans would be one that did not include its starting center, Fab Melo. The Orange released on their website Tuesday afternoon that Melo would be ineligible to play due to what they considered an “eligibility issue”. Although they were nondescript in the reason for his absence, this is a huge blow to Syracuse and a major shake-up in the East region. Syracuse is a different team without Melo, especially on the defensive end of the floor, where Melo averaged 2.9 blocks per game. Although 7.8 points and 5.8 rebounds per game is not that much offensive production to lose, you have to think that the Orange might have been shaken mentally by losing one of their team’s key members just two days before the tournament begins. Although Vanderbilt has been getting most of the attention in this region after knocking off top-ranked Kentucky, we see Wisconsin as a team poised for a run. They play a great brand of postseason basketball- they are big, physical, experienced, and play lockdown defense for 40 minutes. Their road through the East regional just got a lot easier when Syracuse announced they would be playing without Fab Melo. They’ll have a tough second round test against Vanderbilt, but if they can get through there they should be able to overpower a depleted Syracuse team and make a run to the Elite 8. Remember that Ohio State team that absolutely trounced Duke back in November? They haven’t gone anywhere. With Syracuse appearing weakened, the East region just completely opened up for Ohio State. They could have a tough Sweet 16 matchup with Florida State, but should they survive it looks like they’ll be going to New Orleans. Jared Sullinger is one of the top talents in the country, but what makes the Buckeyes particularly dangerous is their physicality and their guard play. Aaron Craft is a floor general that can pick apart an opponent from the inside out, while I think Duke fans remember the fits that William Buford gave us from beyond the arc. They are a very experienced team and that should serve them well in a deep tournament run. There just isn’t a team in this region well-equipped enough to stop them, and if Sullinger somehow is able to elevate his game further for tournament time, the top teams in other regions will start to take notice as well. Our picks for the East region. Looks like Ohio State will be dancing down to Bourbon Street. The Final Four has always struck me as an odd event. It is the only time where a sport completely transforms its game day environment for its biggest event. College basketball is largely played in intimate and intense environments in front it’s most passionate fans. 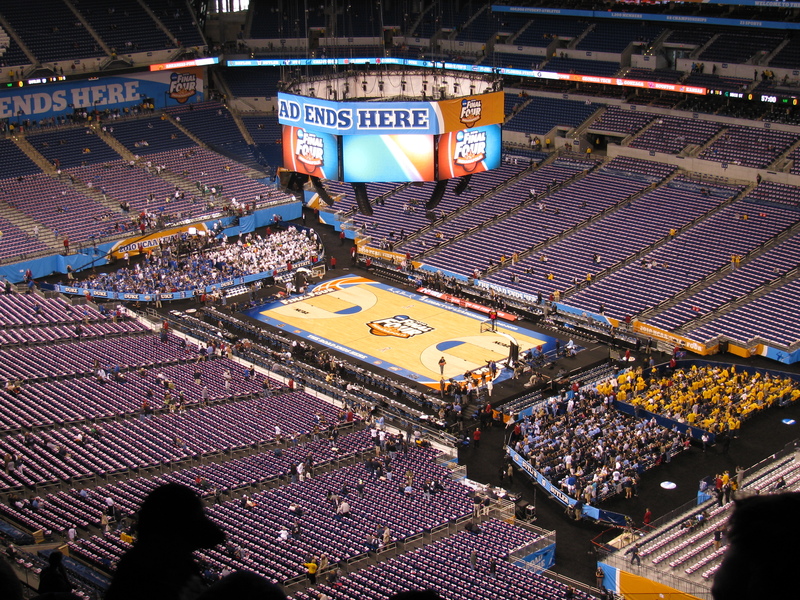 But, when it comes time for the Final Four, the game moves to a football stadium and the size of the crowd is quadrupled. As far as I’m concerned, there are two considerations in the transformation of the Final Four from a basketball arena to a football stadium: the quality of the stadium, and the location of the court. We can see two distinct stages in the NCAA’s quest to make the Final Four a premier event in American sports. At some point, likely soon after the Tropicana Field fiasco, the NCAA decided to start awarding Final Fours to actually good stadiums. The decent stadiums held their ground through the mid 2000’s (RCA Dome, Georgia Dome and Alamodome in 2006-2008), and then Ford Field was given the event in 2009. This was a groundbreaking year for the Final Four for two reasons. First, a premier facility was given the event (it was the first stadium in the large venue era of the Final Four that was state-of-the-art). Second, and more importantly, this was the first year the court was placed in the middle of the arena. Prior to Ford Field, the court had been placed towards one endzone, and only half of the large venue was open to seating. Of course, this still offered twice the capacity of a basketball arena. The Georgia Dome and Alamodome saw attendances of 51,458 and 43,257 in 2007 and 2008, respectively. The next year, when Ford Field placed the court on the 50 yard line, the attendance increased to 72,922 because they opened the entire stadium to fans. One might think this worked out much worse for all 73,000 in attendance, but this was not the case.Under the previous endzone format, fans sitting in the temporary seats had the experience of watchingthe back of the person’s head in front of them. By putting the court in the center, more of the seatingaround the court could be specifically designed for the basketball game, and the pitch of the seats couldbe altered. This 50 yard line format has been used in every subsequent Final Four, including this year’s in Reliant Stadium. The transformation is complete for the NCAA. They have successfully brought the biggest event they have in front of as many people as possible. There’s just one problem: everything that makes basketball great is nullified when placed on the 50 yard line of a football stadium. The Crazies should know this best. 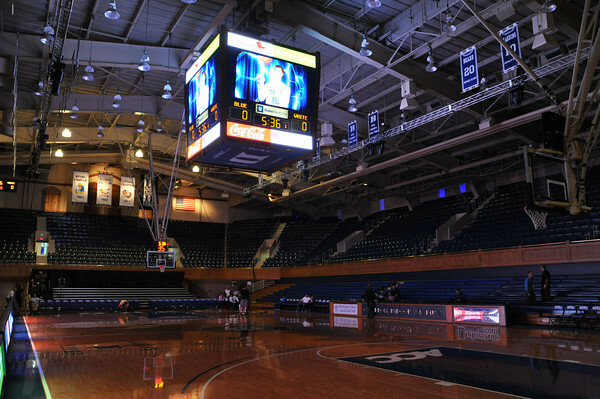 Cameron Indoor is a tiny, tiny venue by today’s standards, and yet it is often lauded as one of the best venues in college sports. This is no coincidence. Basketball is a game designed for anintimate environment. The extreme athleticism of the players is best appreciated when fans are actually close enough to marvel at them. The further away you are, the slower they look and the less impressive it all seems. 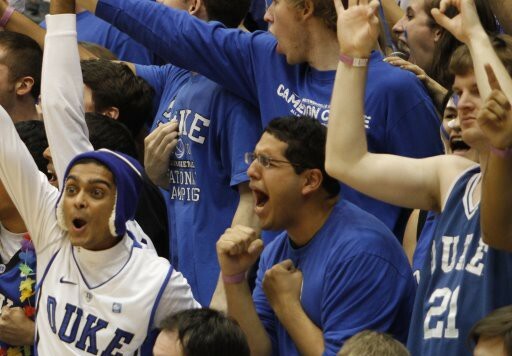 Likewise, Cameron Indoor is one of the best venues because every single fan is into the game, screaming like asylum patients and shaking like them, too. 8,000 fans in a tiny gym are exponentially more intimidating and chill-inducing than 70,000 screaming fans in a football stadium. It is depersonalizing and estranged. You’re spectators, not participants. Of course, that is even assuming all 70,000 attendees are screaming fans, which of course they are not. A majority of the fans at the Final Four these days are indifferent. They are exactly who the NCAA is marketing to now: casual spectators coming to an event, not passionate fans who would attend regardless of the cost. But, as Cormac McCarthy wrote in No Country For Old Men, this is the dismal tide. The NCAA wants basketball in on the riches the Super Bowl or the BCS Championship offers, and they see the nature of the game as irrelevant in their quest for further prosperity. You know, because the NCAA doesn’t make enough money already. And it’s not just money from the extra seats; they can charge more for advertising since more eyes will see it, and they can ask more for TV deals. I suppose this is just the state of modern sports. Personally, I think it affects college basketball the most, since it is the sport most ill-suited for profit-seeking maximization. It is best enjoyed on a small, intimate scale. It has the smallest playing surface, the densest concentration of athletes, and the most subtle movements have the biggest impact. It is a beautiful game to watch, but not from 500 feet away. Aaron Gordon, a senior at the University of Maryland, is the founder of 15min2exit.com, a blog about the stadium experience for fans of all sports. Check the site out on Twitter and Facebook as well. Thanks to Aaron for this excellent article in the wake of this year’s Final Four. And for being the most balanced University of Maryland basketball fan of all time. If you like this kind of material, check Crazie-Talk frequently. There are so many talented college basketball writers (many that follow our Twitter) and we’re excited to start publishing a greater variety of articles. If you have a story idea, pitch it to us: crazietalk@gmail.com. Thanks! DEFENSE. The Mountaineers shot the ball very well in the first half—I got tired of watching us not defend Flowers and Wellington Smith on the perimeter. The eight point halftime margin was nice—and more than I expected. But our defense, which forced 10 Mountaineer turnovers while we gave up the rock just five times, was our driving force tonight. West Virginia has a bunch of great athletes, which is why they had four blocks to our one. But our pressure man-to-man came through again, holding WVU to just 57 points and absolutely deflating a huge yellow-clad audience. Kyle Singler absolutely lit it up. We escaped Baylor without the ACC Tourney MVP scoring a single field goal. But he erupted in the first half, scoring 14 points on some amazing takes to the hole and jumpers. Kyle looked liked an All-American one game after disappearing completely. If Gordon Hayward played his way into the first round against Michigan State, you have to say that Kyle’s 21 on 50% shooting is probably pushing his stock up like the Dow in the 90s. The beard still horrifies Duke opponents. Brian Zoubek had another ‘vintage Z’ performance (is it too early to say that? ), scoring six points on three layups, and pulling down 10 boards. Of our stunning 20 assists, Zoubek had three, all on offensive rebounds and kick outs to the perimeter. The nation’s number one offensive rebounder is playing himself into late second round consideration. 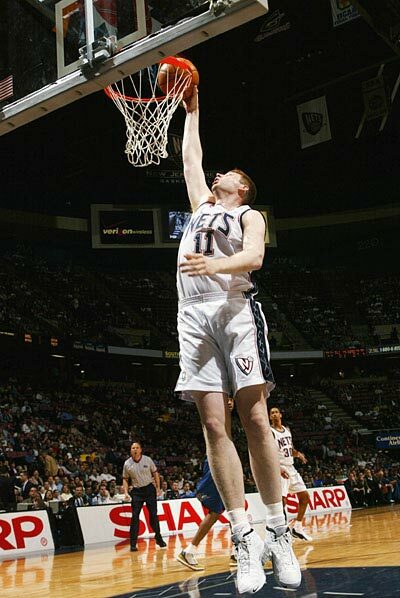 I mean really, Zoubek could be a 12th man on an NBA roster. With some work, maybe he could be like Todd Macculoch. Wow. We hope Da’Sean Butler recovers quickly. The young man has been a warrior all season, hitting an astouding six game winning shots, including this miraculous one against Georgetown in the Big East Tourney Final (thanks for beating the Hoyas! You too, Ohio!). Butler is WVU’s best player, and Bob Huggins considers him the best player he’s ever coached. High praise, considering Huggins has mentored guys like Kenyon Martin at Cincy. Butler’s gruesome fall after colliding with Zoubek is apparently a sprained knee, thankfully not an ACL injury. We wish him a quick convalescence because he should be a first round pick. Who the heck is Deniz Kilicli? OK, we found him. Yikes. Also, it should be noted that Cam Thoroughman, who after our 2008 loss to WVU famously said “Oh my god. Are you kidding me?” after being informed that Paulus was a McDonald’s All-American, has no game and couldn’t elicit enough respect from Huggins to play more than one garbage minute yesterday. I can take the barbs from real players like Joe Alexander or Mazzulla (sort of). But Thoroughman should keep his mouth shut. We saw Mr. Jim Scheyer outside Lucas Oil Stadium a few hours before the Butler-Mich. State tip off. I bet he enjoyed his son carve up the Mountaineer defense for 23 points. Wish we’d seen his wife too, though. I’m really glad Miles Plumlee hung on the rim, although the technical call was still questionable. The Milwaukee Bucks’ Andrew Bogut dislocated his elbow last night in a similar play, and we all remember Evan Turner’s back injury earlier in the year. Even if the call was outrageous, Plumlee was smart to hang on the rim and not crash his 6’10” frame to the ground. That’s a Christ School education for you! Does it have to be Butler? I was cheering for the Bulldogs from the upper decks yesterday, and there is so much to like about this team. The national media is begging for a miraculous upset on Monday night. This matchup feels like a literary binary: city/country, David/Goliath, agriculture/industry…any others I’m missing? The fact is, however, we match up very well with America’s Sweetheart: Matt Howard is a 6’8” starting center for anyone under a rock this Final Four. Before our game, I asked a Butler fan exiting the stadium who he’d rather play. He said West Virginia, because Duke has such great size. Good point. Sorry, pal! Although the Bulldogs are the sentimental favorite and the entire stadium (lingering Spartans and Mountaineers as well) will be cheering against Duke, we feel confident about Monday night. But not overly confident. I’m not sure this kind of situation is precedented—a team in the title game miles away from its home court. We need to take care of business Monday night: I want to see Zoubek hoist the championship plank and roar like the head of the pride. Let’s get this in, Duke! 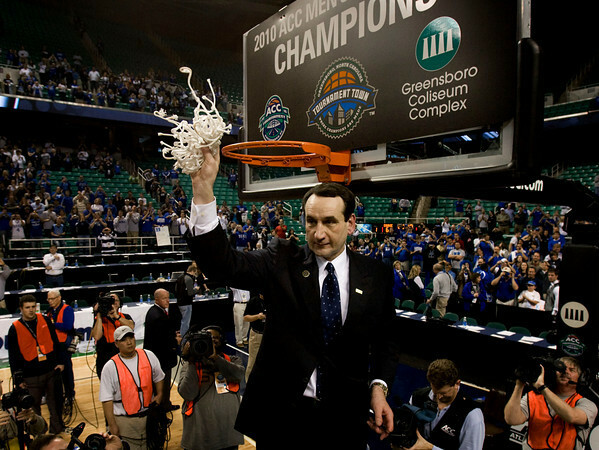 For the first time in six years, Duke is back where it belongs: in the Final Four. After gritty wins against Purdue and Baylor this past weekend, the Devils will be heading to Indianapolis next weekend to face West Virginia in the national semifinals. While it seems like familiar territory for Coach K, it is just the opposite for each one of the players on this Duke team. None had ever gone past the Sweet Sixteen until this year. Despite being the most maligned number one seed in the tournament, Duke was the only top seed to earn a trip to Indianapolis. Let’s be honest here. Who would have thought at the beginning of this season that we would be going to the Final Four? We had two scholarship guards on the roster. Our big men were unproven. We had too short of a bench. The Olympics had jaded Coach K, and the game had passed him by. Hell, Pat Forde wrote that Duke was the only top ten team in the country that could not win it all. But all of that makes this team and this tournament that much more incredible. While this team is not devoid of stars, it excels at playing team basketball. On a night when Kyle Singler failed to make a field goal – for the first time in his three years at Duke – the rest of the team more than made up for him. The King of Jersey, Lance Thomas had an absurd eight offensive rebounds and a tip dunk and-one that was the best play of his four year career. Dre’ Dawk joined the party with two beautiful three-pointers at a crucial juncture in the first half, including a deep shot that cut the halftime deficit to three. Jon Scheyer, who had not shot well at all thus far in the tournament, came up huge with five three pointers and 20 points. But most impressive was the performance of a Nolan Derek Smith, who had the most phenomenal game of his college career when Duke needed him the most. At around 2:30 pm yesterday, Nolan posted an update to his Twitter account that brought tears to my eyes. After watching a screening of the Outside The Lines feature on Nolan and his father, former NBA star Derek Smith, on Saturday morning, Nolan dedicated what was arguably the biggest game of his life to his greatest inspiration. And boy, did he deliver. With a game and career high 29 points, all of which came at critical moments throughout the game, Nolan earned South Regional MVP honors and certainly made his father more than proud. We all know that this journey is not yet over. Duke will face a very tough West Virginia squad on Saturday night. But for now, Crazies, enjoy this moment. This has been the most enjoyable and incredible season I’ve ever experienced. I’ve never been prouder to be a Duke Blue Devil. As the team returned from Houston at approximately 1:30am last night, hundreds of Crazies welcomed the Final Four bound Devils back home. Check it out. Crazie Talk will be headed to Indianapolis on Friday! If you’ll be there, let us know on Facebook, or Twitter! I was on tenterhooks watching the CBS Selection Show Sunday evening. Several questions ran through my head: will we even get a one seed? 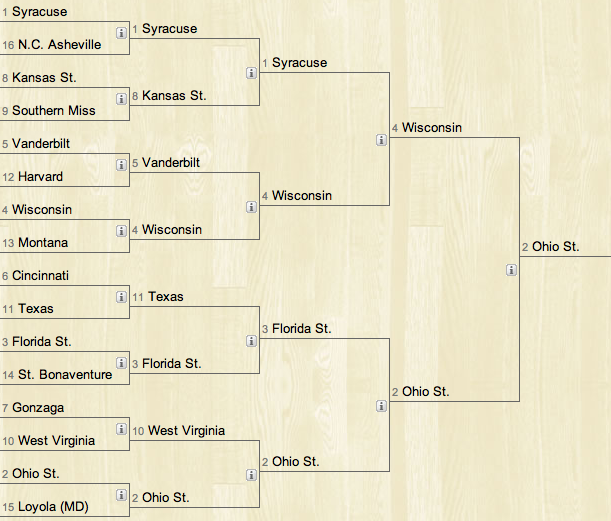 will West Virginia or Kansas State loom as our 2 seed? will we have to travel across the country? Duke does have the easiest path to the Final Four. Will the Devils take advantage? When Duke was placed in the extremely weak South bracket, I kind of sat back in shock. Well, that was easy. Duke has a great opportunity to make a deep run this year—but will we take advantage and make Indianapolis for Coach K’s eleventh Final Four? Let’s find out, with Crazie-Talk’s preview of the “historically weak” South bracket. #1 Duke v. #16 Arkansas-Pine Bluff: OK…Duke will win this one. Moving on. #8 California v. #9 Louisville: This could be an interesting game. California won the Pac-10 regular season, but that doesn’t mean anything, as there were no elite teams playing anywhere on the West Coast, regardless of conference. But the Bears are no pushover, with several star players, including guard Jerome Randle and big man Patrick Christopher, plus former Duke forward Jamal Boykin contributing 12 points and 7 rebounds per game. Louisville has been an enigma this year, beating top seed Syracuse twice but losing by 20 to St. John’s and Marquette, as well as dropping early season games to Charlotte and Western Carolina. Louisville is a tough draw for the Bears, who just lost forward Omondi Amoke to suspension. Louisville forward Samardo Samuels will be able to take care of business down low, and the Cardinal guards will do enough to slow down Randle. I take Louisville in this game, although I desperately hope I’m wrong. #1 Duke v. #9 Louisville: This is a really scary early round matchup for the Blue Devils. Rick Pitino, adultery aside, is a fantastic motivator, and will get his boys up for a face-off with us. But when it comes down to it, our guard play is better than the Ville’s. Scheyer and Singler will have to take care of business, as the Cards have several quick guards to throw at Nolan. I think our bigs can contain the 6’9” Samuels, who gets frustrated if he can’t get push people around for easy layups. PG Edgar Sosa is very inconsistent, and Duke’s hard on ball pressure should get under his skin. K will win this battle of Hall-of-Fame coaches and Duke will advance to Houston. 12 season. Utah State play great defense, just like A&M, and score few points, just like A&M. They also won 27 games, including a victory over seventh seeded BYU. They probably would have had a 10 or 9 seed had they not lost to New Mexico St. in the WAC tournament. Moreover, Texas A&M has been riding the play of star guard Donald Sloan all year, and since Derrick Roland was injured in the fall, haven’t had too much offensive firepower. Still, Crazie-Talk favors playing in good major conferences, and the Big 12 is probably the second best conference in the country. Texas A&M wins a low-scoring game and advances out of this tough first round game. #4 Purdue v. #13 Siena: Everyone has been railing on Purdue since Robbie Hummel went out with a season-ending ACL injury. But I’m not buying all the Siena hype here. The stars of the Saints’ near ’09 near Sweet 16 run, Kenny Hasbrouck, is gone. Edwin Ubiles and Clarence Jackson are a solid backcourt, but still don’t match up well with Purdue’s Keaton Grant, Chris Kramer, and E’Twaun Moore. Contrary to popular assumption, Purdue has just enough to win this game without Hummel. #5 Texas A&M v. #4 Purdue: Like I said—Purdue will have just enough to beat Siena in the first round. The Boiler gas will run out against A&M, who will stifle Purdue defensively. The Boilers scored just 11 points in the first half of a pitiful Big 10 tournament loss to Minnesota. Look for the same kind of stunted offensive output, and a double digit A&M victory. #6 Notre Dame v. #11 Old Dominion: First of all, the Fighting Irish are grossly overseeded. Although they played well without big man Luke Harangody, Notre Dame doesn’t deserve this position, in the weakest region no less. The Irish have been peaking without star player Luke Harangody, playing better defense and getting more players involved, such as Ben Hansbrough the Younger and veteran PG Tory Jackson. However, the committee didn’t do them any favors by matching them up with Old Dominion. The Monarchs took out Georgetown earlier this year at McDonough, proving their ability to play with tough Big East squads. Old Dominion will beat another Big East team in this game, and Notre Dame (and former Duke assistant Coach Mike Brey) goes home early. #3 Baylor v. #14 Sam Houston State: Each of these teams would love to play in the Houston regional, but Baylor has too much talent. Baylor guards Tweety Carter and LaceDarius Dunn complement forwards Quincy Acy and Ekpe Udoh. The Bears play high-octane offense, averaging nearly 80 points per game. Baylor advances here. #3 Baylor v. #11 Old Dominion: The Monarchs do not have the offensive potency to match up with the Bears. Forwards Gerald Lee and Frank Hassell meet the towering, athletic Udoh and Acy and are dominated on the blocks. Look for this to be a blowout, with Baylor advancing past ODU to the Sweet 16. #7 Richmond v. #10 St. Mary’s: Oh, we love the Richmond Spiders! St. Mary’s has to travel all the way across the country for this one, and no Patty Mills means no containing Spider guard Kevin Anderson, the Atlantic 10 Player of the Year. Omar Samhan is a good player for the Gaels, but again, no respect for West Coast teams (as if beating Gonzaga is an accomplishment!). Richmond wins by 10 and moves on. #2 Villanova v. #15 Robert Morris: The Wildcats haven’t been at their best of late, but Scottie Reynolds and Co. take care of business against Robert Morris and advance to face Richmond. ‘Nova by double digits. #2 Villanova v. #7 Richmond: Here’s the first big upset! Anderson and David Gonzalvez are good enough to match up with the ‘Nova guards Corey Stokes, Corey Fisher, and the aforementioned Reynolds. Villanova has tanked of late, and Richmond barely lost to fifth seeded Temple in the A-10 championship game. Richmond may be the Cinderella of the Tournament, and their first big victim will be Villanova. So long, Taylor King! Have fun chain-smoking all the way back to Philly. Richmond heads to Houston. #1 Duke v. #5 Texas A&M: The Aggies are close to home for this game, and their fans (and thousands of Duke haters) will be out in force rooting for an A&M victory. Donald Sloan is a star, and the strength of the Aggies lie on the defensive end. We have struggled against powerful and athletic teams like Georgia Tech and Georgetown this season, and the less-than-stellar run through the ACC Tournament does not inspire too much confidence for this type of opponent. I think Zoubek, LT, and the Plumtrees come up big. A&M doesn’t have too many bigs other than Bryan Davis, and if they can’t shoot the ball, they won’t be getting too many offensive boards over Zoubs. Duke takes this one by 5-10 points. OK. Here we are, on the brink of our first Final Four (in six years). Baylor—a team with tremendous speed and athleticism—stands in our way. The Bears have all the elements of team we have sucked against: athletic guards in Dunn and Carter, a powerful 6’10” big man in Udoh, and an upstart young coach in Scott Drew. Sounds like Villanova circa last year? Just replace Dunn and Carter with Reynolds/Fisher/Stokes, and Udoh with Dante Cunningham. This game will take every last ounce of Duke’s energy, but I believe we can win. And it will have to come on the defensive end. Baylor scores a lot of points, but their guards do not have tremendous size: Carter is 5’11” and Dunn 6’4”. If Nolan Smith can slow down Carter and Scheyer can neutralize Dunn’s scoring, we can win the battle on the perimeter. Duke will have to go deep in its bench—expect the quickness of Baylor to force a lot of early fouls. Dawkins must play and contribute positive minutes. Zoubek will have to play without fouling, as the Plumlees can’t control their hands of late and keep picking up silly touch fouls. Lance Thomas has to keep the ball in his hands and be able to finish on offensive putbacks. Truth be told, Duke will have to play its best game of the season to get past Baylor. But I’m confident because of the man in the dark suit on the sideline. Coach K is 10-1 in Elite 8 games. Scott Drew coaches at a program that has never won an NCAA Tournament game, period. Advantage, Duke. We will squeak out a win, probably in the high 70s or low 80s. Crazie-Talk will be tweeting throughout the Big Dance. Follow us on Twitter and on Facebook for more solid coverage of Duke’s run to the Final Four.